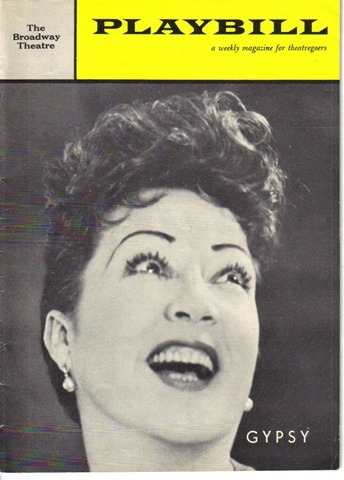 Ethel Merman in Gypsy on the cover of Playbill. So Barbra Streisand is still talking about playing Mama Rose in Gypsy. Now, I love Babs, but she is 74, and when Dainty June and Rose Louise went into vaudeville in the early 1920s, “Mama Rose” was only in her early 30s. Seriously, Barbra, who’s going to play your Dainty June, Madonna? My dream version of Gypsy would have been a mid-1960s revival starring Judy Garland as Mama Rose, and Liza Minnelli as Gypsy. Excuse me, I have to go lie down for a few minutes, even thinking of that. I’ve seen Judy Garland herself doing “Some People,” but Liza blows her own Mom out of the water. Barbra Streisand, I love you, but leave the next Mama Rose to . . . Jeez, I can’t even think of any age-appropriate Broadway belters today who would be good in the role. Let’s just wait another 20 years and see what the next generation brings. This entry was posted in Eve Golden, Music, Stage and tagged Broadway, Eve Golden, Gypsy Rose Lee, Judy Garland, Liza Minnelli, YouTube Theater. Bookmark the permalink. 5 Responses to Eve Golden’s YouTube Theater: Some People . . . I have to admit sometimes wondering what would have happened if one of the classic belters like Merman, who aimed every note square at the center of the upper balcony, had been miked for sound the way Broadway shows are today. The results would surely have given Krakatoa East of Java a run for its money. Had they miked Merman, the death toll might have run into the hundreds, and passersby as far south as 34th Street would have been deafened for life. Gotta have the pipes for the roles. Idina Menzel as mama, Ariana Grande as baby? As much as I love Megan Hilty and Kelli O’Sutton, or Foster Hara, or whatever the hell their names are, I can’t see them pulling off Mama Rose. Now, The Cheno could, and in ten years, Rachel Bloom.